← Upholding human rights in a state of emergency: What Nigeria must do now! While it is recognised that the government has taken various legislative, policy and regulatory reforms in the health sector, lack of implementation of the existing frameworks is significant. Violations of women’s reproductive health rights still exist and more needs to be done in order to fully realise safe motherhood. The 2012 African Commission Union report assessing MDGs progress in Africa rated Kenya as being among the 10 African countries with regressing indicators in maternal health. The Kenya Demographic Health Survey 2008-2009 conclusively argued that it was impossible to say with confidence that the status of maternal mortality had changed since 2003. This data is subsequently reinforced by the country’s recent ranks in the State of the World Mothers Report of 2013 by the Save the Children Foundation. According to the 2013 report, Kenya disapprovingly secured position 156 out of the overall 176 countries, ranking lower than her East African neighbours with the exception of Somalia. As per the report, the number of first-day deaths in Kenya stands at 14 700 newborns while the lifetime risk of maternal death in Kenya is 1 in every 55 women. According to the World Health Organization, the underlying contributors that account for 80% of all maternal deaths are severe bleeding (after childbirth), sepsis, high blood pressure and unsafe abortion. Of particular interest to this discussion is the rate at which unsafe abortions continue to be a leading cause of avoidable maternal injury and death in Kenya. The 2012 Guttmacher Institute study, “Abortion and unintended pregnancy in Kenya,” revealed that abortions are common and are almost always unsafe. This is further supported by the findings of the study conducted by the Kenya Human Rights Commission and the Reproductive Health and Rights Alliance in 2010 which highlighted that unsafe abortions account for approximately 33% of maternal mortality in Kenya. Young Kenyan women who procure unsafe abortions run the risk of suffering from complication such as sepsis, infertility, haemorrhage and obviously, death. The provision of safe abortion services when needed remains highly restricted and stigmatised despite Kenya’s adoption of liberal provisions under Article 26(4) of the Constitution, as well as the enactment of the 2012 Standards and Guidelines for Reducing Mortality and Morbidity from Unsafe Abortion. Abortion as a topic remains sensitive, emotive and receives tremendous backlash from religious leaders such that it is not openly debated, yet it continues to contribute to the present maternal mortality rates. As we join the Global Leaders Council in congratulating Kenya as this year’s award winner, the following recommendations are strongly made to the government. 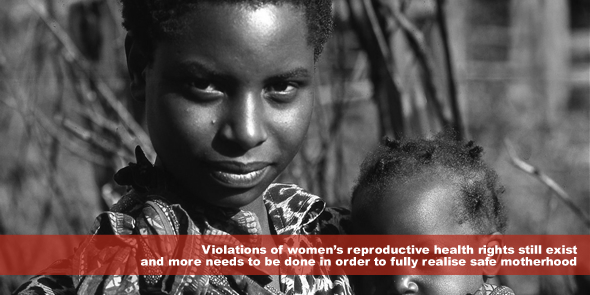 First, more emphasis must be placed in addressing unsafe abortions as a major contributor to the loss of women’s lives. Second, a large percentage of the population remains ignorant of the laws and circumstances under which safe termination can be procured. Sensitization on the consequences of unsafe abortion must be widely undertaken to educate young adolescents who face a higher risk of complications and death as a result of unsafe abortions. Additionally, health care providers must be continuously trained on how to conduct this procedure in life threatening cases where a woman qualifies to have a safe abortion. Lastly, in light of the provisions of Article 26(4), the reservation to Article 14(2)(c) of the Protocol to the African Charter on Human and People’s Rights on the Rights of Women entered by Kenya must be lifted. There are also a number of challenges that need to be addressed if full implementation of the free maternal healthcare project by the Jubilee government is to be fully realized. Top on the list is increasing the number of operation theatres, hospital beds, medical equipment and drugs to cater for the upsurge of women seeking to deliver at the facilities. Second, starting this July, the government must undertake to provide adequate annual budgetary and other resources to the health sector for the implementation and monitoring of actions aimed at free maternal health care. The number of trained medical professionals will also need to increase drastically in anticipation of the increased number of women who will voluntarily opt to deliver in health facilities due to the minimal financial implications. Where one of these elements lacks, then the very violation of women’s reproductive rights that we seek to address will have failed. Saoyo Tabitha Griffith is an Advocate in the High Court of Kenya and holds an LLM degree from the Centre for Human Rights, University of Pretoria. congrats Tabitha.with u all the way.